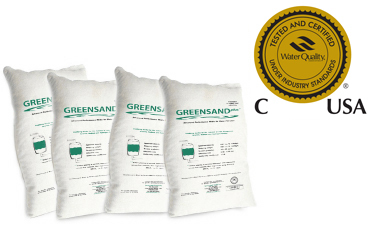 GreensandPlus and manganese greensand bulk-sacks are constructed of strong woven polypropylene with polyester lifting loops capable of holding 3,300 pounds. Completely closed after filling, they may be lifted using a crane or fork-lift and then positioned over the manway or filter and emptied via the discharge spout. These nonreturnable bulk-sacks are available at standard pricing and are shipped palletized for van, container, or flat-bed loading. Palletized & labeled with gross & tare weights & number of cu. ft. Note: A stop flow discharge spout is also available at an additional charge. Please call for details.